Dog lovers – we are a unique breed. Since getting our yellow lab 2 years ago, many things have changed in what I do and how I do it. I vacuum non-stop, I always wear slippers so my socks don’t soak up water bowl splashes on the kitchen floor and I met my new neighbors by trying to get my overly friendly dog to come back into his own yard. On the flip side, I get enthusiastically welcomed home every day and I have a walking buddy who is always ready to go. My daughter works for the Humane Society and she is always showing me pictures of all the great dogs available for adoption. I know if she had a bigger place she would bring home more of her work on a permanent basis. She recently took part in a fund-raising campaign for their shelter ambassador, Kira who is also a pit bull. Kira even got a spot on the morning news and gave the weather man a big kiss before leaving. The story of Wallace starts with him living in a shelter and because of his behavior; they are considering having to put him down. A couple who volunteers at the shelter fights for Wallace and adopts him. They have to work on his behavior around their other dogs and find ways to productively use all of his energy. They discover that Wallace has a gift for chasing and catching Frisbees. This is the part of the book that I could visualize since my lab, Chase, has the same gift with tennis balls. I could see Wallace, just as I see Chase happily running, catching and returning only to sit with anticipation for the next throw. 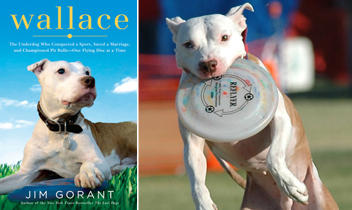 If you are a dog lover or not, I suggest you check out Wallace by Jim Gorant if you are looking for a good book.